← Which oil is best for my car? Roads are slippery when wet (or covered in snow)! Last week the weather in DC Metro areas took a turn for the worst! Freezing temperatures, snow, and ice almost shutdown the government…Well it actually did for a few hours. The driving conditions caused by the winter storms were horrendous. Cars were slipping and sliding all over the road. Unfortunately, not every car is equipped with four-wheel drive and even if you do have four-wheel drive, if your tires tread is worn down you may find yourself in some trouble. 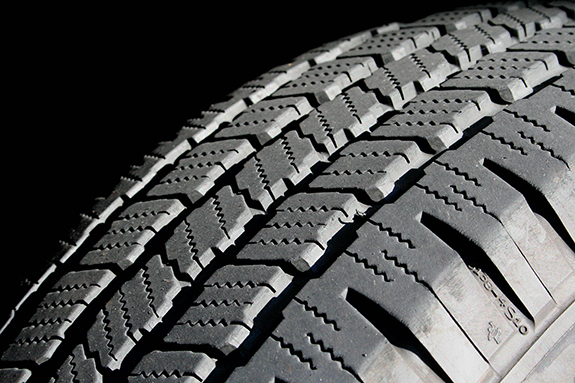 Did you know most states require your tires to have more than 2/32” of tread depth? Don’t worry; if you are not sure how to check for your tire treads depth, there is an easy way to figure it out, all you’ll need is the loose change in your pocket! To find out your tread depth you’ll need a penny. First: Turn the penny perpendicular to the tire surface and parallel to the tread. 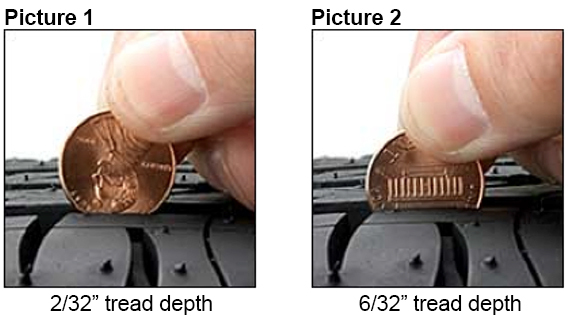 Place the penny in several tread grooves across the width of the tire and in as many places as you can around it. If you can always see Lincoln’s head (as shown in picture 1 below) you only have about 2/32” of tread depth left. That’s the minimum depth of tread that is legally allowed by most states safety inspections. Anything less than that and you’re playing with fire. A tire with the bare minimum of tread is on the verge of failing you in wet conditions of any kind. It’s even worse in these wintery road conditions, so you might want to think about coming to one of the 19 Koons locations to make sure your tires are both safe and legal. One other way to tell is if you’ve driven more than 30 thousand miles on them you may want to have them looked at professionally. If your tires passed the test in picture 1 turn the penny around (as shown in picture 2) and try getting a more accurate measurement. If the top of the Lincoln Memorial is always covered by the tread, than your tires have more than 6/32” of tread remaining. 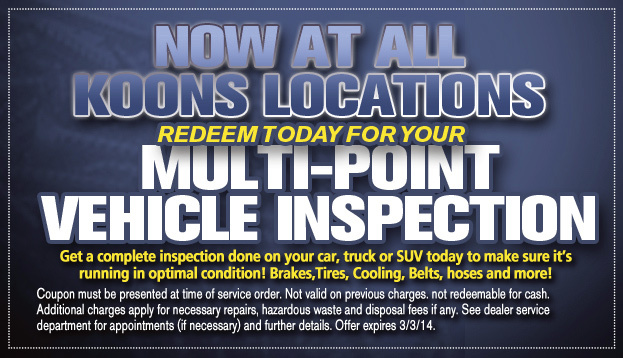 To help make sure you’re safe and to have a qualified technician go over your vehicle use the coupon below for a Complimentary Multi-point Inspection (that includes tire wear). at any of our Koons locations and we will check your tire tread for you at no charge! Posted on February 3, 2014, in Automotive, Maintenance Monday and tagged Jim Koons, Koons, Koons Automotive, Maintenance Monday. Bookmark the permalink. Leave a comment.